As reported by The Hollywood Reporter, Golden Globe-nominated actor and real-life Marine Corps staff sergeant and drill instructor R. Lee Ermey has died from complications of pneumonia. The news was also confirmed by Ermey’s longtime manager, who posted a statement on Twitter about Ermey—referring to him by his nickname “The Gunny.” Ermey was 74. Best known for his performance as foul-mouthed Gunnery Sergeant Hartman in Stanley Kubrick’s Full Metal Jacket, Ermey built his acting career on playing hard-nosed military-types who have a habit of screaming at subordinates. He essentially embodied the modern trope of the “angry drill sergeant” in TV shows and movies, either because they were based on his Full Metal Jacket character or because they were literally played by Ermey himself. He popped up as an angry military guy in Miami Vice, Kim Possible, the Starship Troopers spin-off Roughnecks, Space: Above And Beyond, Body Snatchers, SpongeBob Squarepants, The Frighteners, Scrubs, X-Men: The Last Stand, Toy Story, House, and The Simpsons (playing the memorably named Col. Leslie “Hap” Hapablap). As much as Ermey always seemed typecast, he also played a surprising number of non-military characters, including the police captain in Seven, Sheriff Hoyt in the 2003 Texas Chainsaw Massacre (and its 2006 prequel), Mayor Tilman in Mississippi Burning, and as Coach Norton in Saving Silverman. He also hosted various military-themed documentary shows, including Mail Call and Lock N’ Load. Ermey was born in Kansas in 1944, and after growing up as a “troublemaker and a bit of a hell-raiser” (as he put it in a 2010 interview), Ermey found himself in front of a judge who gave him a choice: Go to prison for criminal mischief or join the military. He chose the latter and served in the Marines for 11 years, rose to the rank of staff sergeant, and was eventually given a medical discharge for injuries he received during his service. He got his first acting roles while going to school in the Philippines, playing soldiers in The Boys In Company C and in Apocalypse Now—during which he also worked as a technical adviser for director Francis Ford Coppola. 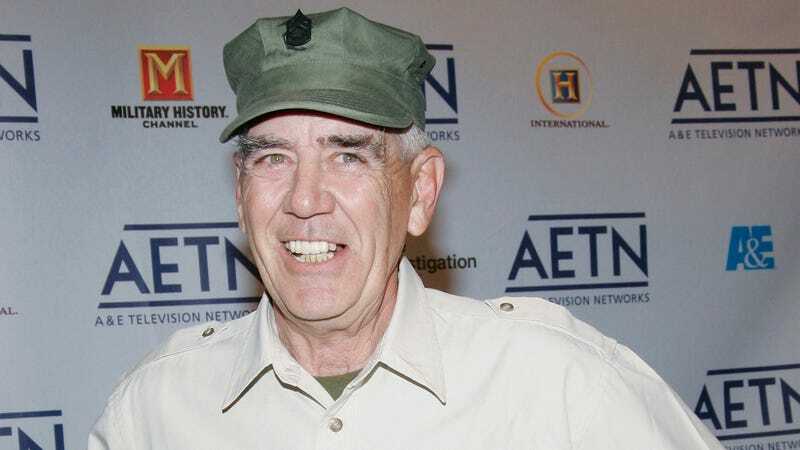 As his career slowed down in recent years, Ermey was vocal about concerns that he was blackballed in Hollywood for being critical of President Obama, telling TMZ in 2012 that “you better watch out” if you’re a conservative in Hollywood. The Simpsons: "Sideshow Bob&apos;s Last Gleaming"